It is impossible to establish whether this instrument was made by either Hans Tucher II or Hans Tucher III, since both flourished at the time when it was made and both seem to have used the same maker's mark, an upright snake with a crown. The name Tucher is here given as 'Ducher', a spelling which also occurs on several other dials. 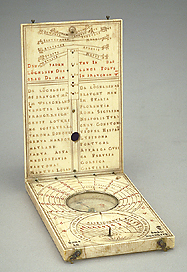 It is a typical example of a Nuremberg diptych dial containing a wind rose, a lunar volvelle, a string gnomon dial and two pin gnomon dials. The pin gnomon dial, inset in a scaphe on the lower leaf, has not only Italian hours, but also the lengths of the days in hours. The pin gnomon dial on the upper leaf has no hour markings and can therefore not be used for telling the time.